Want to know how to increase your course completion rates? Or are you confused by SCORM? 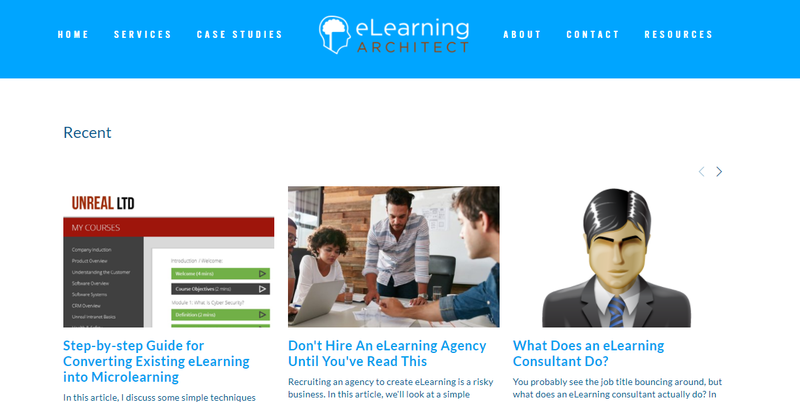 There's a wealth of free eLearning knowledge online waiting for you right now. Today, we're sharing the top resources we could find. 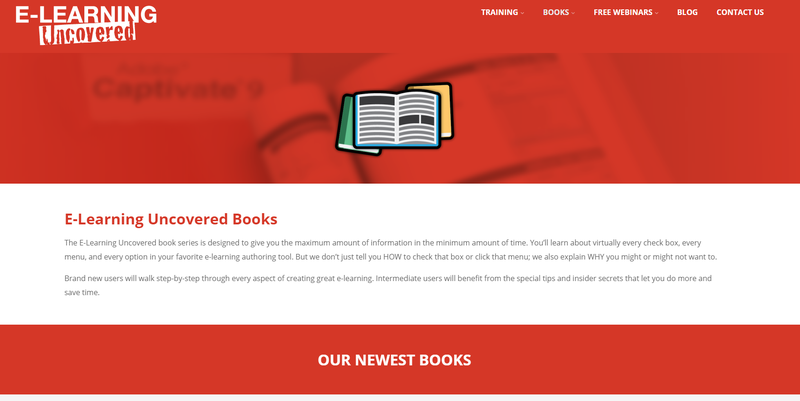 It's a long list - almost 50 resources - but these websites will teach you practically everything you’d like to learn. Let's get started! 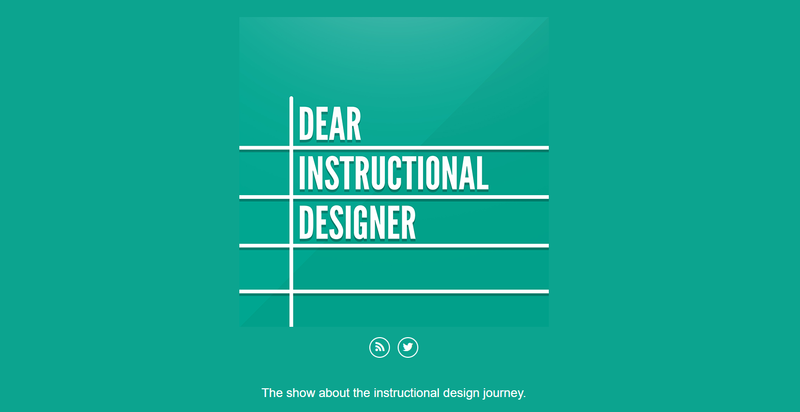 Hosted by Connie Malamed, an eLearning information, and visual designer, this podcast is all about ‘helping you design smarter learning experiences’. Covering topics such as implementations of authoring tools to blended learning, the guests are top notch too. Although aimed at higher education, there is still lots of valuable information for businesses on this podcast. 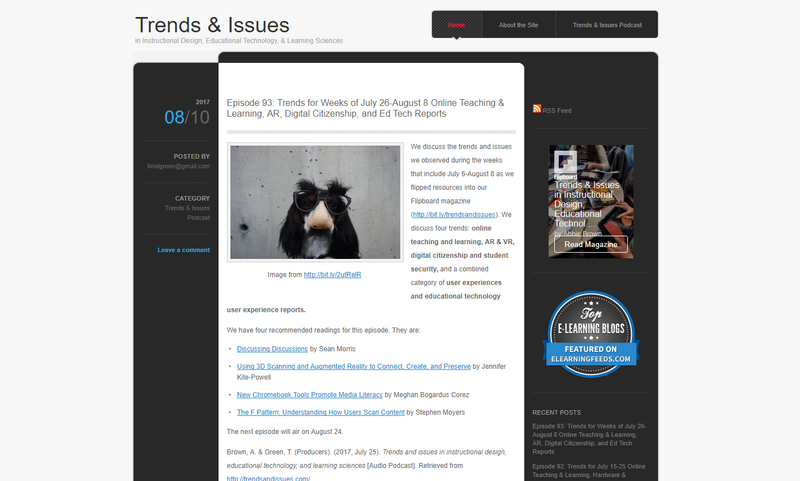 The hosts discuss the latest news in the world of eLearning so you can keep up to date. From authoring tools to using PowerPoint for video, this podcast is perfect for course creators and designers who want to get an insider's perspective as well as practical eLearning tips. 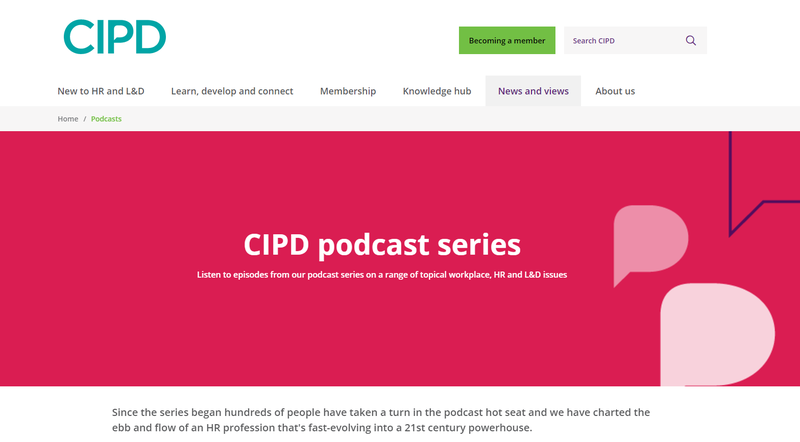 Not strictly eLearning, as CIPD’s podcast covers a range of topical workplace, HR, and L&D issues. However, they do have a number of informative episodes on eLearning and online training. 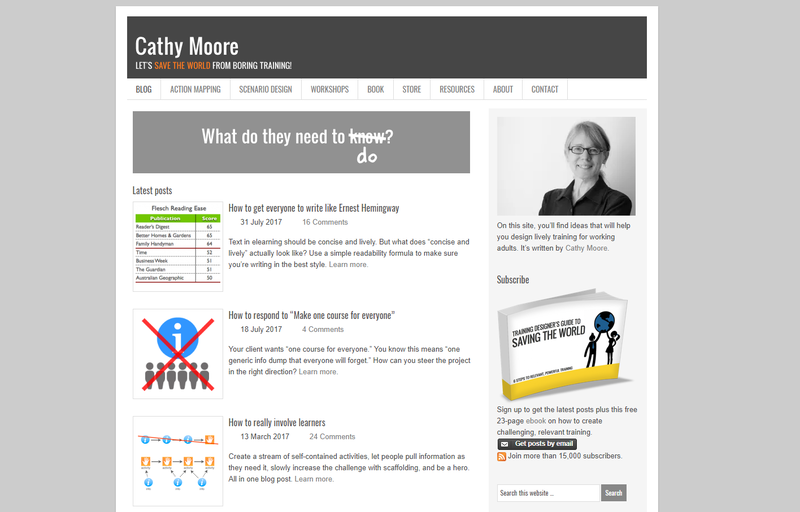 With the tagline ‘Let’s save the world from boring training!’, Cathy Moore’s blog aims to do just that. Topics include ‘How to really involve learners’ and ‘How to get everyone to write like Ernest Hemingway’ featuring examples of these tips in action so they’re super easy for you to implement. 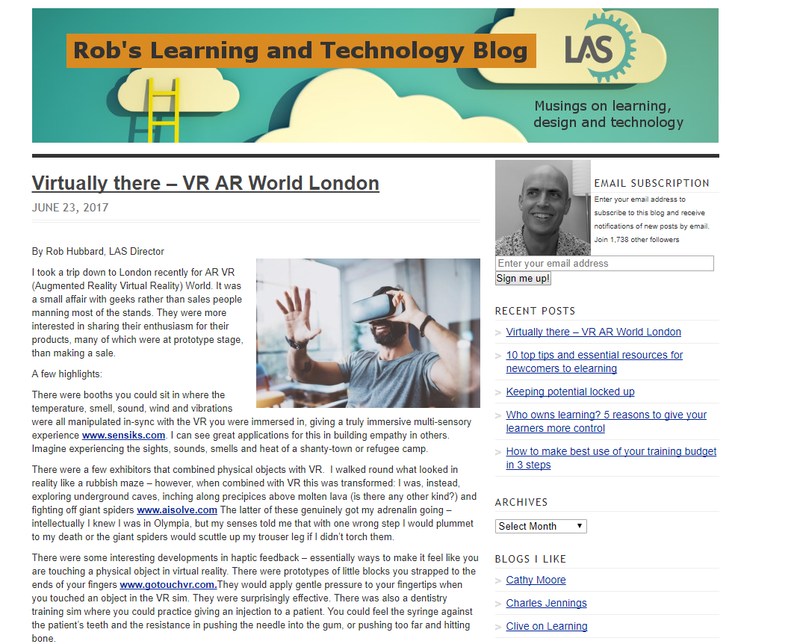 From overviews of industry events to the future of eLearning, David Kelly’s blog has lots to delve into. This blog is aimed at helping organizations embrace and improve their eLearning and it does just that! Written by Tom Kuhlmann, a training industry expert for over 20 years. His blog focuses on people working in the eLearning industry and how you can become an eLearning pro. This blog by Ant Pugh is a great hybrid - part for course creators, part for LMS shoppers. It provides lots of information about starting eLearning projects, creating content and working with eLearning platforms. 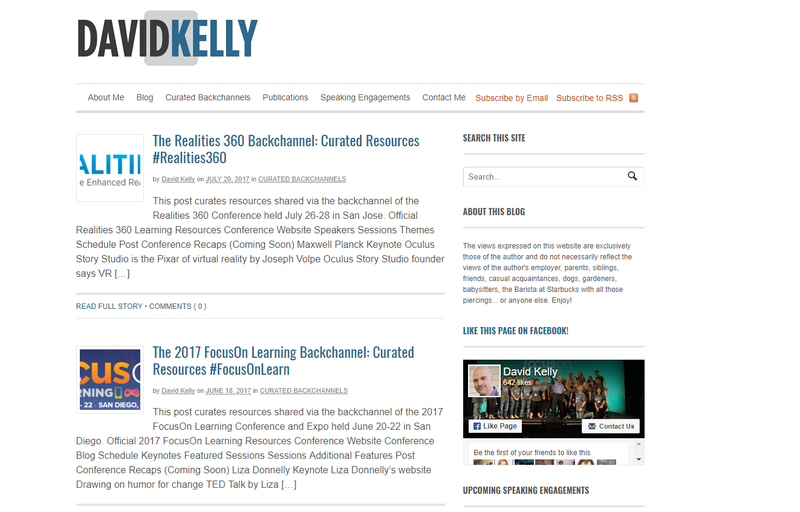 Part thought leadership, part helpful advice, Ryan Tracey’s blog E-Learning Provocateur is an interesting read. If you’re interested in knowing more about the world of eLearning, it’s one to check out. 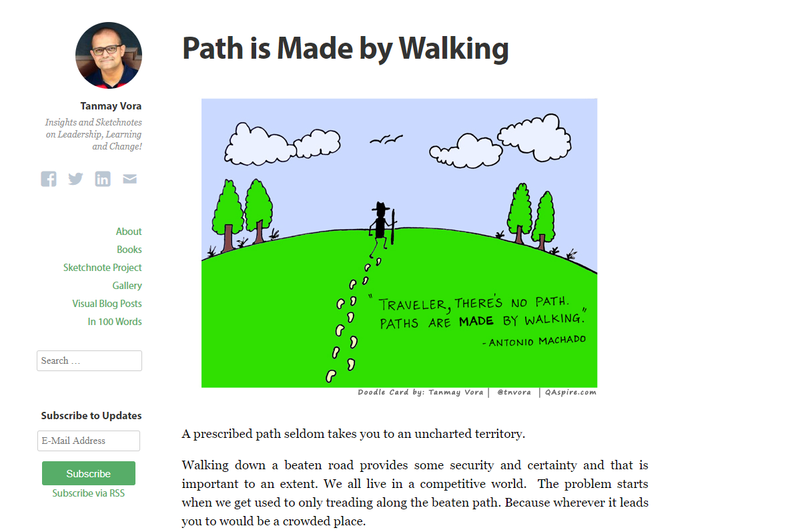 With the tagline “Insights and Sketchnotes on Leadership, Learning and Change!”, that pretty much sums up Tanmay Vora’s blog. This is a perfect read if you’re in a leadership role in your organization. Craig Weiss has a strong reputation for being incredibly knowledgeable about all things LMS. 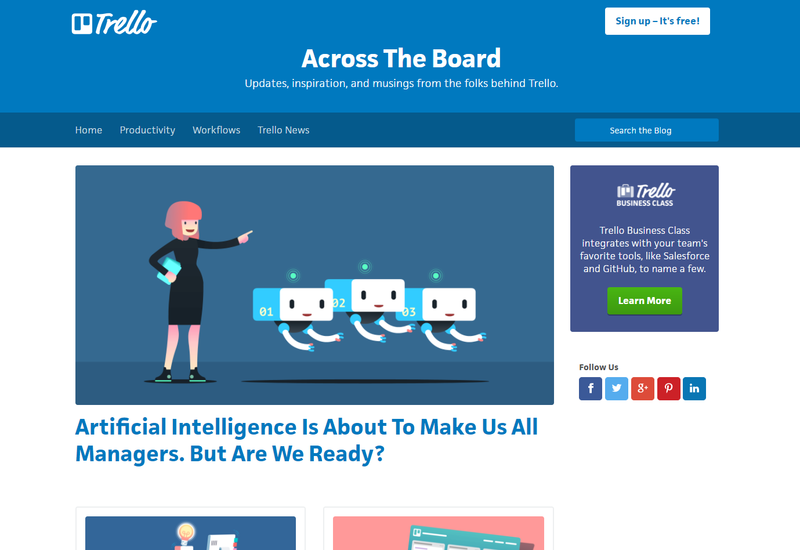 Featuring reviews, trend insights and more, you can get a lot from this blog. This is a prized resource for all in eLearning. If you are a seasoned professional or just looking for quick tips to make your eLearning simpler, you’ll find it here. Elucidat is a great authoring tool with an equally awesome blog. From eLearning inspiration to actionable advice to better your course building, it’s a must-read. 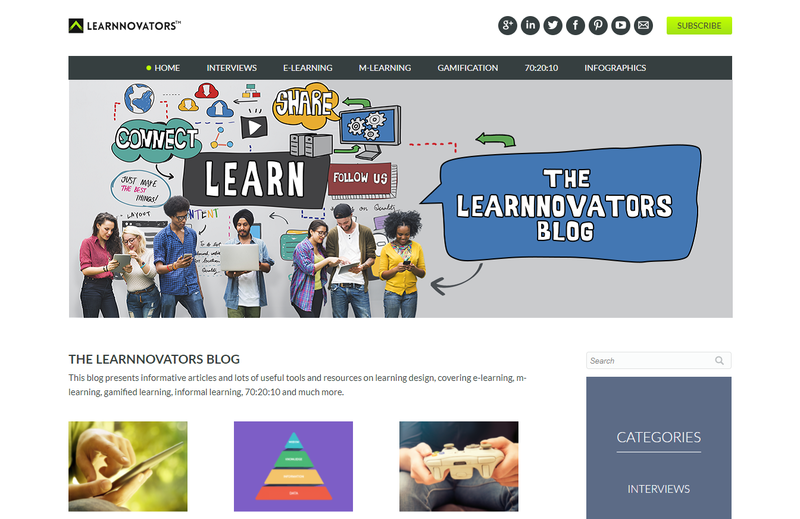 Covering a wide range of topics like learning design, e-learning, m-learning, gamified learning, informal learning, and 70:20:10, the Learnnovators Blog is sure to have something of interest for you! We couldn’t make a list of blogs without including our own because we think it’s pretty darn good! With tons of advice all about the world of learning management systems, it’s worth a read - if we do say so ourselves. Trends, best practices, authoring tools, design, development - eLearning Industry is a one stop shop for all things eLearning. If you are just dipping your toe in the online training water or are a seasoned professional, they’ll have something for you. 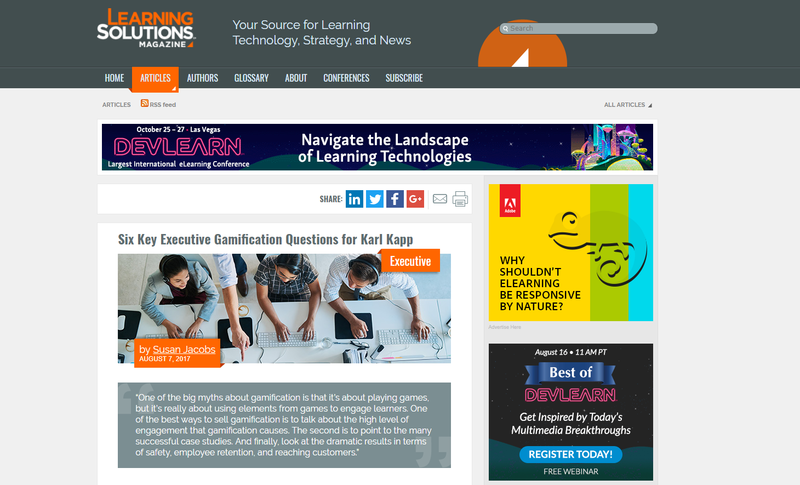 Around since 2002, Learning Solutions Magazine is one of the most trusted eLearning resources out there today. 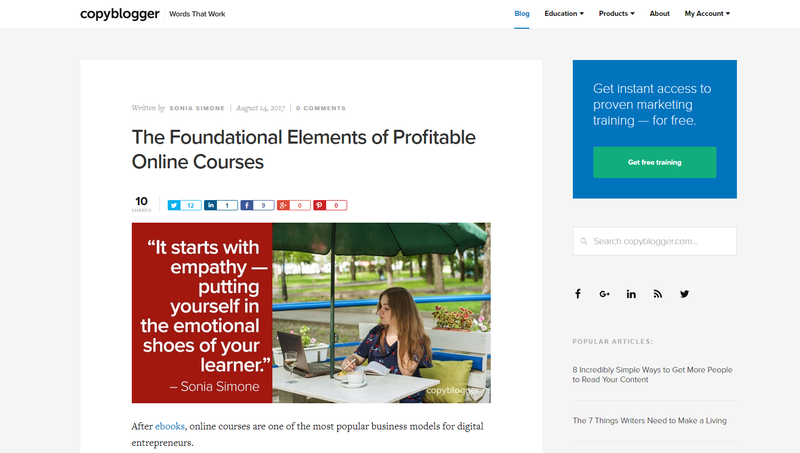 Delivering posts about an array of topics in online training, it’s an invaluable resource. 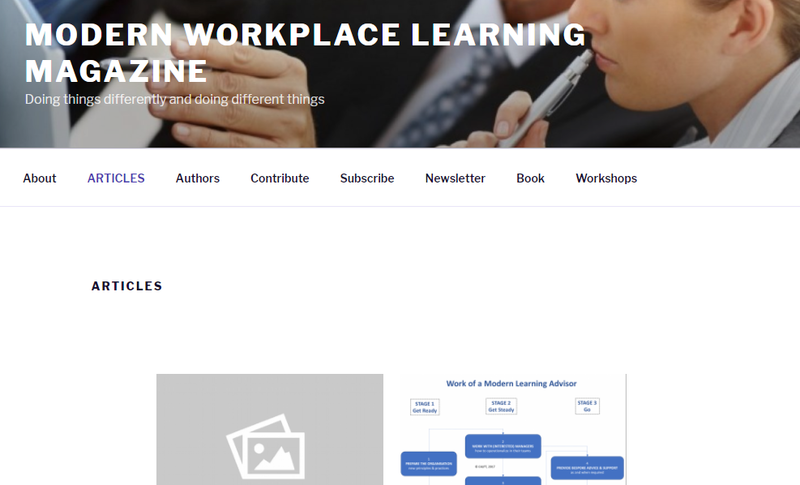 Focused on L&D departments, this site has plenty of material for people interested in bettering their business’s training and supporting your learners along the way. Described as “a multimedia publication focused on the importance, benefits and advancements of a properly trained workforce”, Chief Learning Officer has a lot of industry know-how. Covering topics such as leadership, learning delivery and strategy, it’s an invaluable source. Self-described as a place to get “insights, ideas, perspectives, and discussion on the current trends in the learning industry, the technologies”, TWIST has varied, but invaluable content on offer. 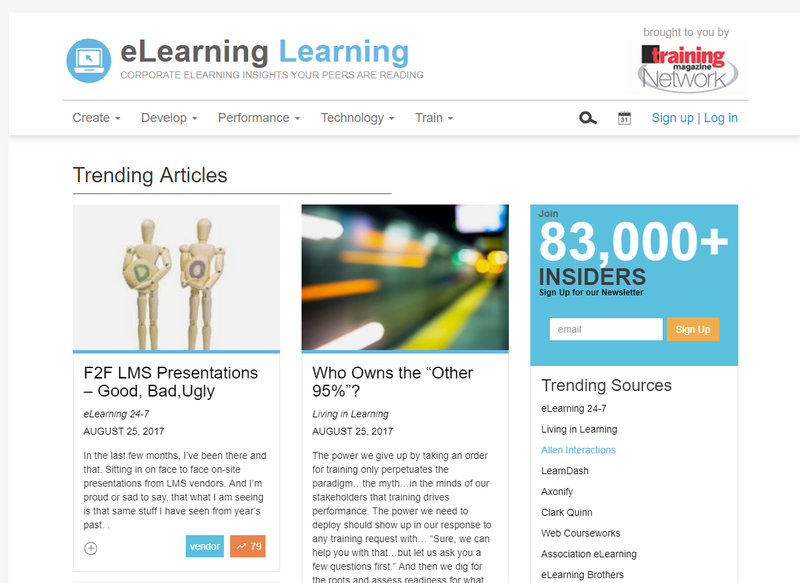 Featuring content from a number industry thought leaders, eLearning Learning collects all the best resources in one handy place for you to digest. 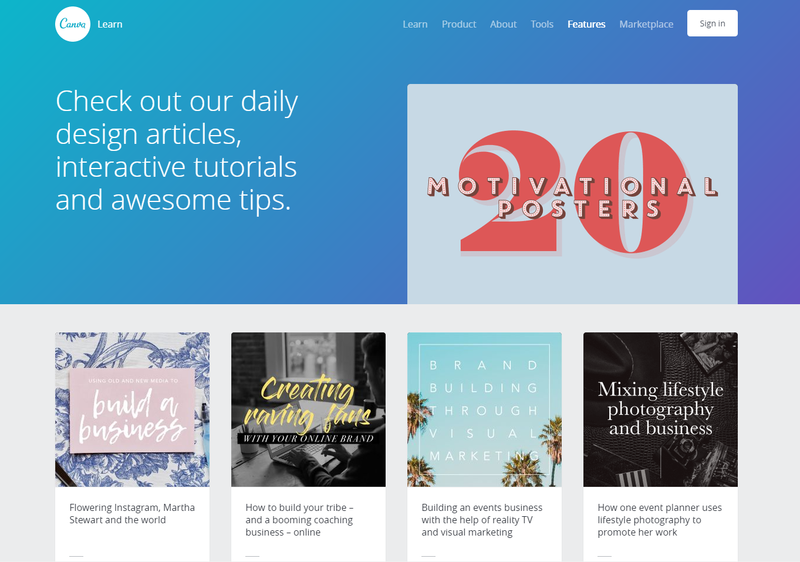 One to share with the eLearning course builders in your organization or even read yourself if you’re interested in improving your course designs, Canva has some great tips on simple design principles. A blog about organization and productivity is a perfect read for eLearning professionals trying to juggle everything. From tracking tasks to delegating online training jobs, this blog can really help! 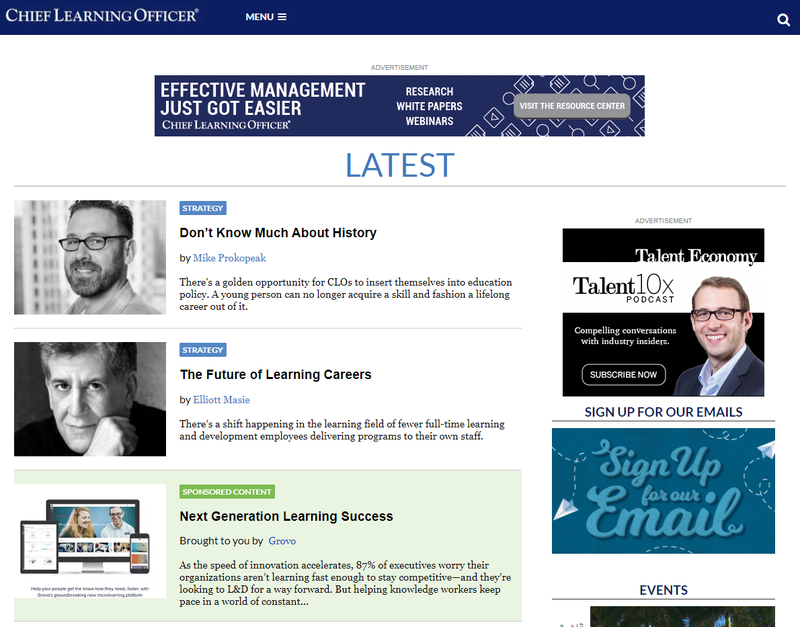 The Harvard Business review covers a wide range of topics including eLearning. Keep an eye out as you’re sure to find a golden nugget on there that could really help you. A good read for all - eLearning professional or not - Copyblogger has amazing tips on how to optimize how you communicate. With video being such a huge element of online training, it’s important your team knows how to get it right. 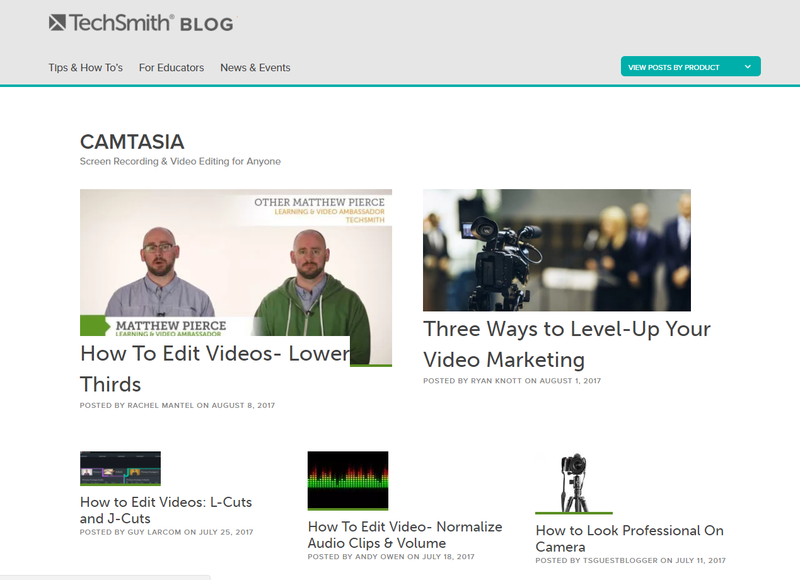 Camtasia’s blog has straightforward tips that really help. Another blog focused on video and we love it! Not only does it contain advice on how to film things better, it also talks about how to use video to help your company. Get inspired by beautiful presentations with this helpful resource. 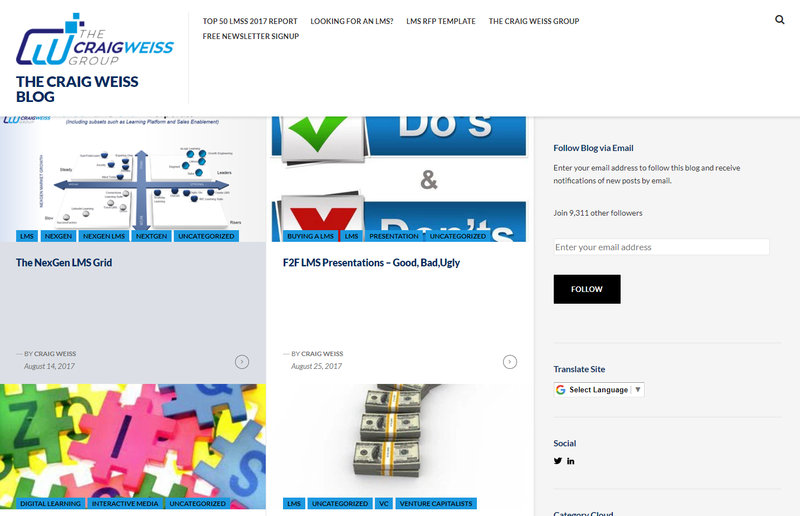 From infographics to data visualizations to presentations, there is great info here to optimize your online training. 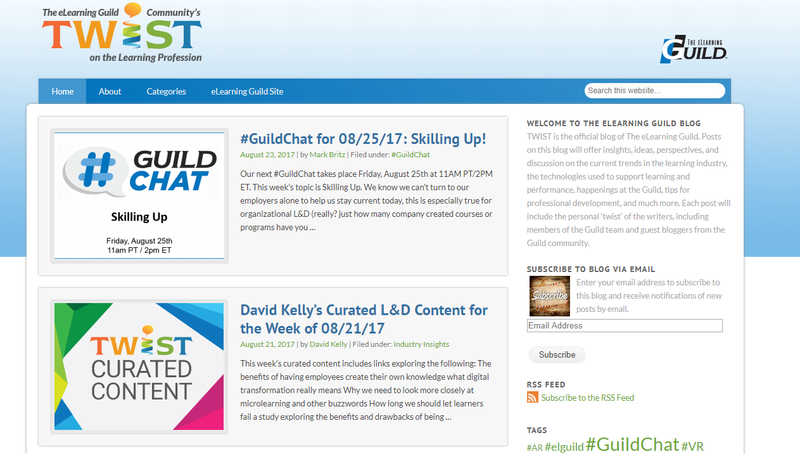 Filled with insightful content, eLearning Guild is a must join community for eLearning professionals. 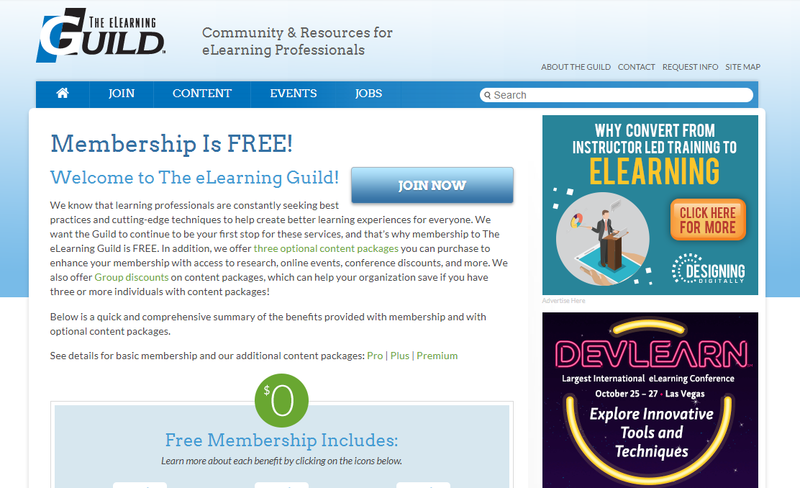 They offer different packages for members that allow you access valuable assets to improve your eLearning. 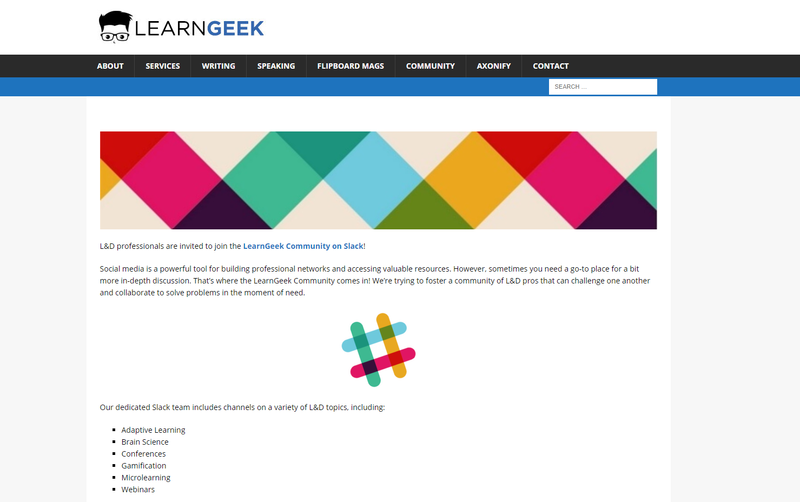 There are a variety of impressive topics up for discussion in the LearnGeek Slack Community. 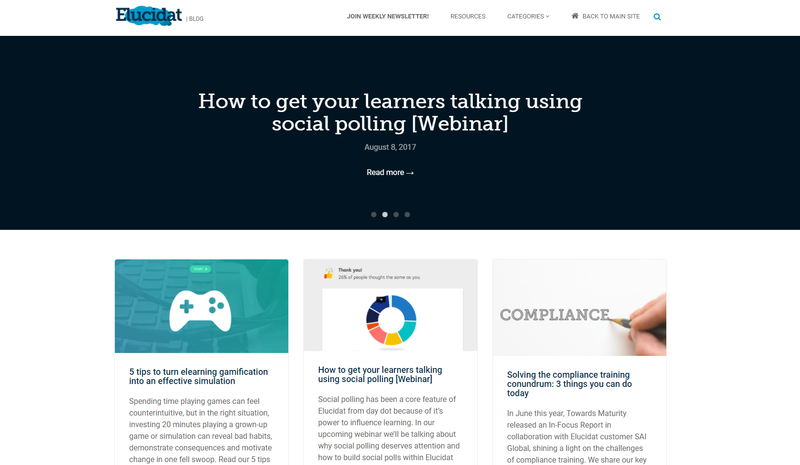 Join and you’ll be contributing to interesting chats about gamification, microlearning, webinars and more! 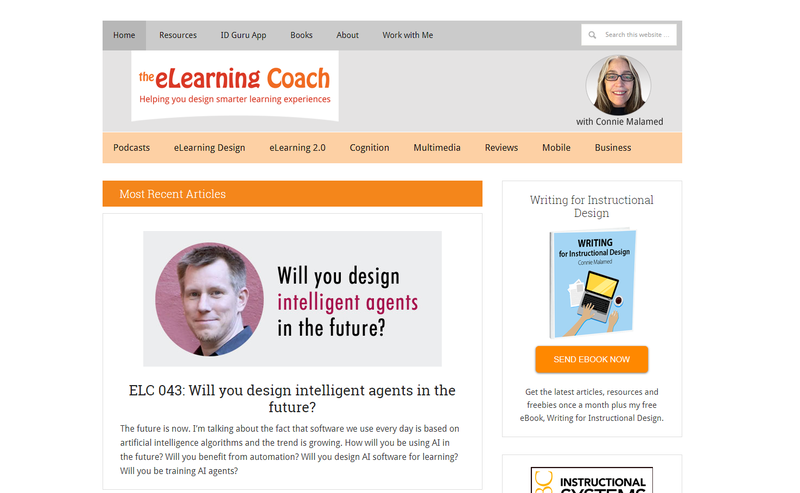 The number one community for course creators, Articulates E-Learning Heroes is a great place to ask, answer or read about your burning eLearning questions. 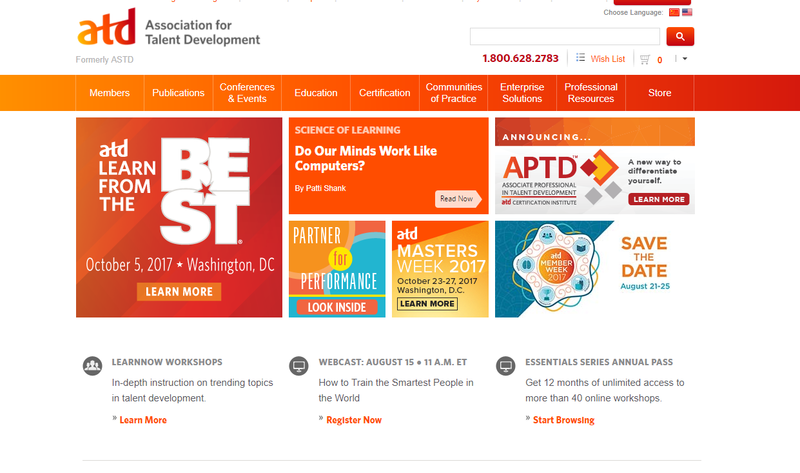 ATD, or the Association for Talent Development, is a membership organization that is all about furthering your employees’ skills. They have lots on offer in their membership center that is informative for anyone working in an association. 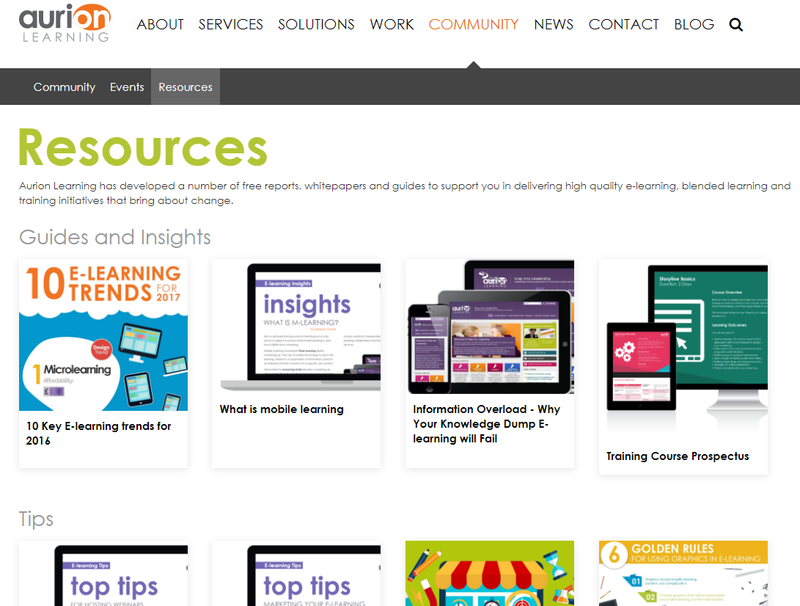 There are lots of things to absorb on E-Learning Uncovered’s website. 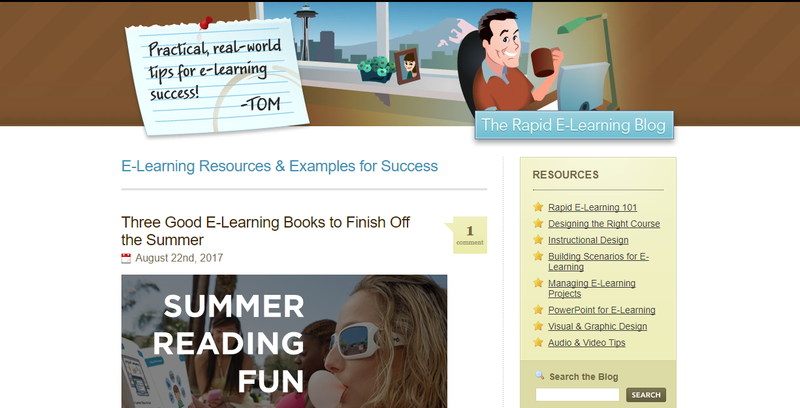 They’ve got eBooks, webinars and more all about how to make the most of popular authoring tools. 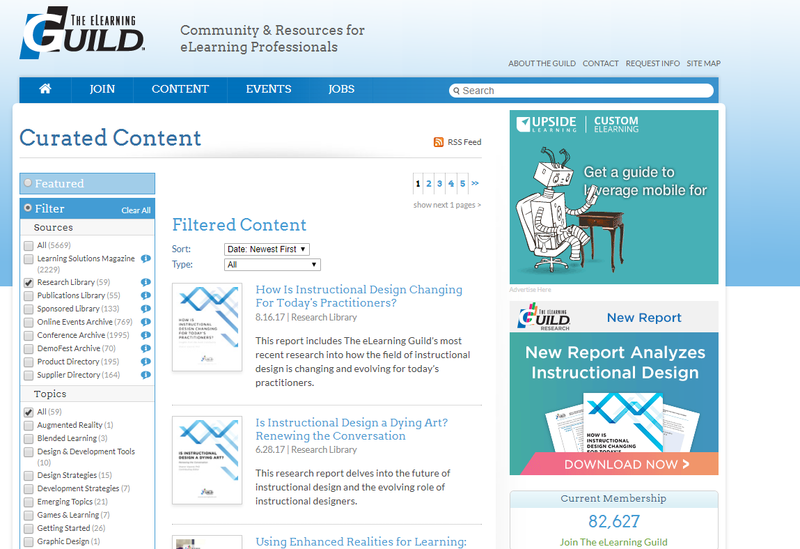 Free guides, templates, and resources - that sums up Elucidat’s Resources in a nutshell! Easy to download and full of great advice, it’s worth a look. Tagoras has plenty of in-depth knowledge about eLearning for you to avail of. 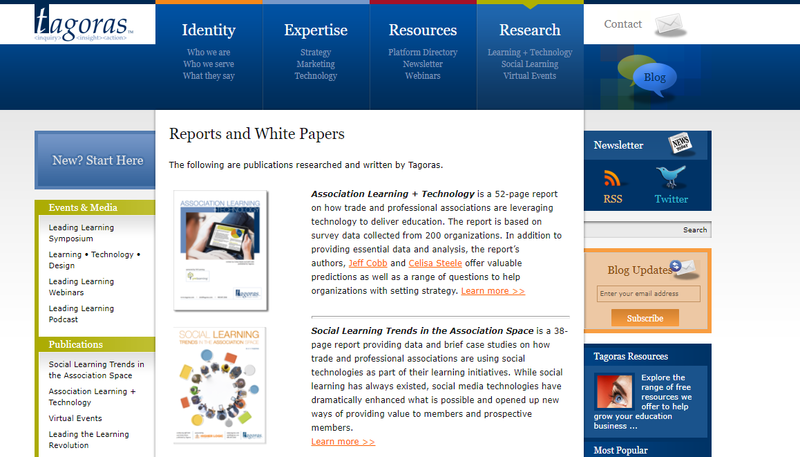 From reports on the industry to insightful research, it gives you a deeper look at the world of learning. eLearning Guild’s Research Library is a bountiful place full of material. They work with industry analysts and leading practitioners to bring you case studies, presentations, white papers and research reports all about eLearning. Again, we have to mention ourselves! 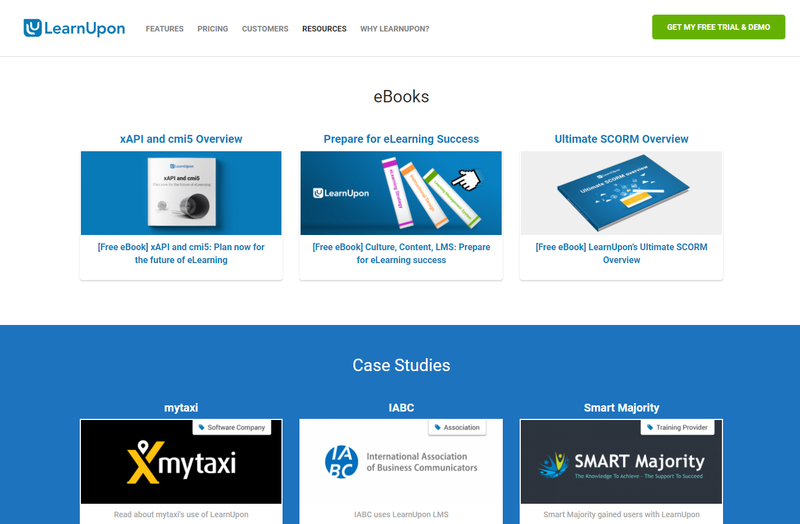 LearnUpon has a number of insightful eBooks, webinars and case studies all about eLearning, learning management systems and more. It’s also constantly being updated and added to so you have the latest and best advice. Aurion Learning has a number of high-quality guides for you to read. They are on practical subjects like ‘Hosting a Webinar’ and ‘What is mobile learning’ so you will gain lots of actionable knowledge. E-Learning Heroes have a great selection of eBooks for you to download. With titles including ‘E-learning for Beginners’ and ‘9 Steps to Better E-Learning Project Management’, there is lots to sink your teeth into. 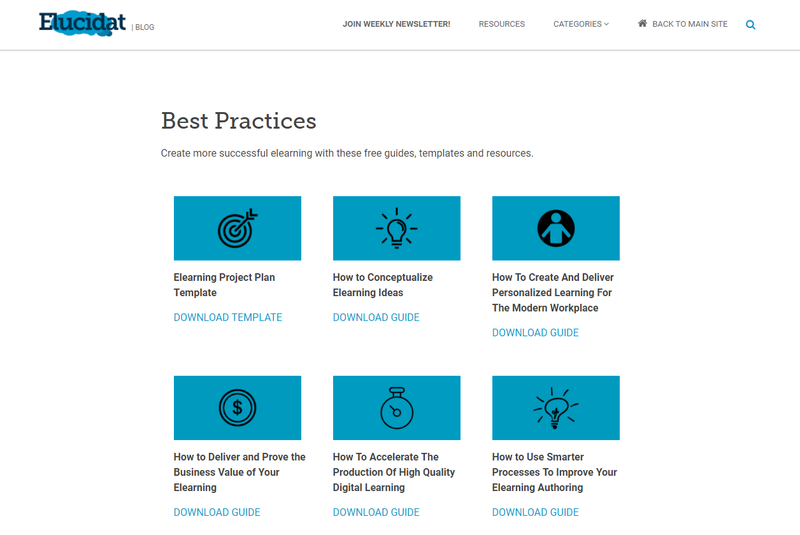 And that concludes our round-up of the ultimate eLearning resources. Did you love learning about all these invaluable resources? Or did we miss your favorite one? Let us know your thoughts in the comments below.